With a rich catalogue reaching back to the early 1980's, American synthesist, pianist and composer Tim Story remains a highly distinctive voice in American ambient. In an in-depth interview with Ambient Music Guide he talks about his career, the art of light & shade and his love of collaboration. 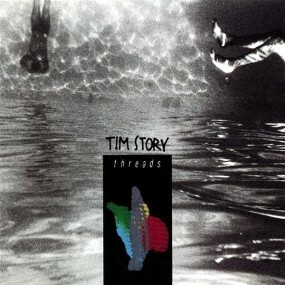 Listen to enough of Tim Story's music and you'll be struck by two, seemingly contradictory, things: a curious and experimental musician with a penchant for darkness and ambiguity, yet one who's never forgotten the value of structure and a melodic line. Perhaps this is why his unique "21st century chamber music" attracts such diverse listeners: his sounds are lauded by fans of ambient, new age, classical chamber music, indie rock and electronica alike. 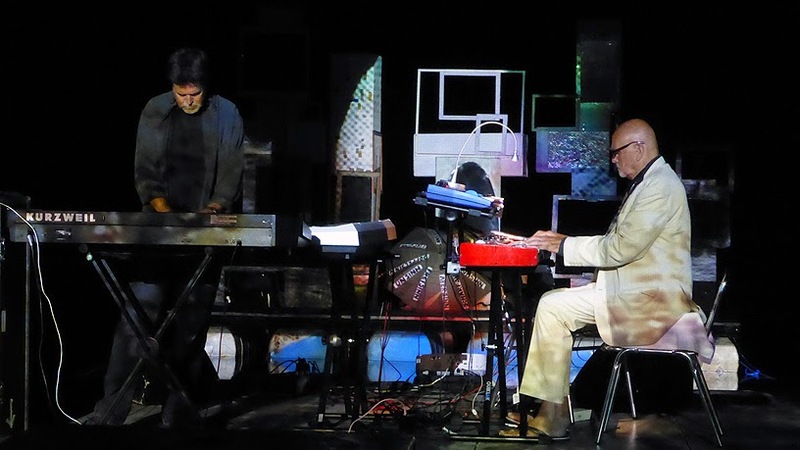 Comparisons have been made with Californian pianist Harold Budd, not surprising given that both Story and Budd are influenced by the music of late-19th Century French composer Eric Satie (1866-1925). Satie was consciously anti-dramatic and shunned the pompousness of Romantic symphonic music in favour of complex, spacious, melodic music for solo piano and small ensembles. 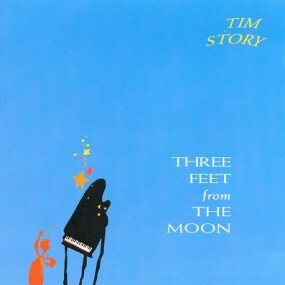 Tim Story's own "miniatures" echo many of those qualities, but he also has something Satie never had: the endless textural possibilities of the synthesiser and recording studio - tools which he explores with a child-like curiosity - along with production and engineering smarts to match. AMG: When you started making your own music in the 1970's, did you have any reference points? Say, for example, the post-classical piano of Satie and Debussy? TS: My reference points were a strange mix of things. As a kid, my parents were both music fans, with eclectic tastes - Stravinsky's "Rite of Spring" would be on the record player one minute, and Simon and Garfunkel the next. And my mom loved playing piano, so I definitely got an early taste of Debussy, my favorite of all the music she played. As a teen in the 1970's I was restless with the music that was around, and I was dabbling with toy tape recorders and the family piano, when I got a great job in the local mall record store that I haunted, and I think that really changed my life. In an incredibly fortuitous break, John Thompson - who later became hugely influential in the Cleveland scene of Devo and Pere Ubu - managed the store. He opened my eyes to a world of music that was so far beyond the dull rock and roll that was ever-present on the Midwest airwaves. Lou Reed, Eno, Can, Robert Wyatt, the Mahavishnu Orchestra, Roxy Music, Cluster, Steve Reich, Miles Davis - just a ton of great, diverse, inspired music. AMG: Your piano-led sound has often lead listeners to call your music 'modern classical'. But I suspect the reality a rather more complicated. TS: Yes, if you'd seen my record collection in the 70's, I think you'd agree that it was definitely more convoluted than that. There probably weren't many common denominators between Kraftwerk, Lou Reed, and Erik Satie, but that didn't stop me from trying, I devoured them all. My early experiments with tape loops and electronics led to my first album Threads (1981) and it actually featured very little piano. I got one of the early Tascam multitrack reel-to-reel recorders, and composing these little 4-track symphonies was addictive - using whatever instruments I could get hold of - a garage-sale vibraphone, a banged-up old Les Paul, a PAIA synth kit that my girlfriend's dad assembled for me. My makeshift bedroom studio was in the basement, and the piano was upstairs, so the piano didn't get on tape until a little later. But the piano always beckoned, and despite my pretty severe limitations as a player, it was kind of the de facto instrument I would gravitate toward when I wanted to work out pieces. The delicacy and nuance that you could coax out of a piano really focused me on composition, too, and the pieces became more compact, direct and intricate. For me, it was a perfect foil for my fascination with electronic timbres, sounds design and sonic manipulation. Not typical 'modern classical' for sure, but I was a stickler for composition, and it was attention to that, rather than meandering synth arpeggios, that began to define my writing. AMG: In some of the traditional classical music from past centuries I sense a certain emotional distance between the music and the listener, a kind of stiffness and polite coolness. That distance doesn't seem to be in the chamber music of modern artists like yourself and Max Richter and Thomas Newman. There's a more tangible intimacy. Any thoughts on why that might be? TS: Well, I was a bit of a loner in school, and I never wanted to be in the school band or the choir, so my music definitely developed a very personal, private fingerprint. Making electronic music in your basement wasn't really a 'thing' in 1970's Ohio, to say the least. So music for me was more like writing a very personal book in solitude than a social, rock band kind of experience. My totally self-taught, totally idiosyncratic approach wasn't much on technique, either, but it did allow me to translate my 'voice' in a relatively unique way - untainted by habits of playing or writing that might have crept in from years of lessons or music theory. Knowing that I would never be able to play a Debussy piece better than the average 12-year-old was really liberating in a way. It forced me to rely on composition and my own odd little melodic and harmonic and rhythmic inventions. That really helps close that 'emotional distance' you describe. But intimacy also raises the dreaded specter of sentimentality, so I was always looking for ways that would embrace sometimes difficult or unlikely musical answers, ones that would be more honest, even if they were more ambiguous or troubling. Mystery, uneasiness, and a little darkness were always elements in my best pieces - elements which I think are much more devastating in intimate, rather than aloof settings. But of course, making intimate art is sometimes more dangerous than art with a little more emotional distance. You're really putting some raw personal stuff out there, open to more personal criticism - you can feel pretty exposed. I found that out later when some of the music was co-opted by, or at least viewed under the umbrella of, "new age" music, which I always bristled at. I'd spent years carving out what I hoped were evocative, vivid little miniatures, and it was disconcerting to be occasionally lumped into what seemed like 'wallpaper' pleasantries that felt to me to be pretty shallow and twee. AMG: In the late 70's I understand you wrote a fan letter to Joachim Roedelius of the German group Cluster, who you would later end up collaborating with. What attracted you to his music - and just what did you say in that letter? TS: Yes, I think it was in the early 80's after my first album was released. I was a real admirer of Joachim's solo music, and the music with Cluster. There was something about the music that really connected, and there was something amazingly personal about it that made me audaciously feel like he might actually appreciate a note about it from a young punk like me. Writing fan letters was not even remotely familiar to me. I think this was my first and last! So I can't imagine what I was thinking. TS: Yes, and we stayed in touch, and when I came to Europe for three months in the summer of 1983 he shocked me with an invitation to come to Austria to visit. We really hit it off, and I ended up overstaying my welcome for a really fantastic week with he and his family. We even spent a few days camping together on a beautiful alpine lake in the little village of Lunz, which became the title, 20 years later, of our first major collaboration. It took that long to work with him because Joachim and I, and our families, became such good friends that we never seemed to find the time to work on music amidst all the fun and bottles of wine. 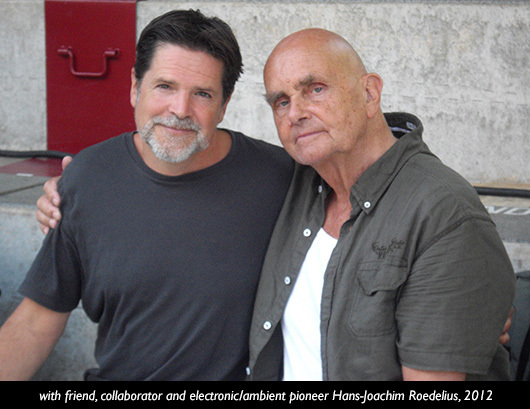 Our connection also led to another great friendship with Dieter Moebius, Joachim's partner in Cluster. Moebi and I have just finished a collaboration with Jon Leidecker called Snowghost Pieces (2014) which is out this year on German label Bureau B.
AMG: Your first proper album release was on a European label in 1982. How long had you been sending demos around before that label picked you up? And why Europe? TS: The music I really connected with at the time was predominantly European - Can, Cluster, Robert Wyatt. I loved the idea of making small-scale personal music in what were essentially makeshift home studios. So it was small, iconoclastic European labels that I naturally gravitated towards when, after years of experimentation, I finally had 45 minutes of music that didn't totally embarrass me. Around 1979, I sent out about 6 cassette tapes of the material, and in retrospect it was amazing that 2 of them actually ended up making a difference. First was Gerard Nguyen from the French label Atem, known for the dark spiky 'rock in opposition' bands Art Zoyd and Univers Zero. Gerard was just starting a label to be called Labyrinth, focusing on new electronic and instrumental 'ambient' music, which was pretty new at the time. He liked the music a lot, and Threads was planned for a release in 1981 on the new imprint. But after a handful of test pressings, the label was suddenly shut down, and Threads was shelved. But another of the tapes had ended up in the glovebox of an associate of Klaus Schulze in Berlin. Many months later, the cassette was played for David Elliott and Wolfgang Fenchel, two visiting music journalists who liked the music, reached out to me, and suggested a new label in Norway, Uniton Records. By then, I had finished a new batch of pieces which became my first real release, In Another Country (1982), which Uniton released later that year. TS: Yes, the new age thing was really a double-edged sword - your question frames it perfectly. The popularization of the genre really did give people like me - whose music existed on the fringes - a undeniable push. The fact that you found it in a record store at all, albeit in the new age section, is of course infinitely better than not finding it. My first releases were before the genre 'arrived', so they were approached very creatively by reviewers, listeners and record stores. You might have found them in any number of sections in the record shop: electronic, jazz, classical, avant-garde. Afterwards, you'd predictably find them in 'new age' - great, as far as marketing, but not so much aesthetically. Seeing the albums through the lens of new age to me diminished the number of possibilities, reduced the ambiguities. At least I had some good company: Harold Budd, Brian Eno, Terry Riley, Wim Mertens, Penguin Cafe Orchestra all joined me there in the new age bins! When new age reached its commercial peak with all sorts of pale imitations and general silliness, it was especially hard to distance oneself from the growing and well-deserved backlash. But it's disingenuous to completely bite the hand that fed me - the phenomenon brought my work out of the shadows, and created a lot of good opportunities down the road. AMG: One of the charms of your 80's albums like Untitled (1984) and Three Feet From The Moon (1985) is that you're doing these piano/electronic combos where the synths sound very much like synths - rough at the edges, even toy-like at times. Was that entirely intentional, or did the limitations of the technology play a role? TS: Probably a little bit of both, but a lot of it was intentional. The contrast of the real piano against unapologetically electronic timbres really appealed to me. I felt like synthesizers should be liberated from the task of imitating acoustic instruments. I never particularly liked the Tomita or Walter Carlos style of electronic music - it seemed so silly to invent this amazing new instrument and then force it to simply copy the sound of other instruments. As if you'd go to the trouble of inventing the first tuba, and then force it to sound like a flute. I was fascinated by the synthesizer's ability to make new sounds, and though I really did work on making the sounds compelling and organic, I wasn't afraid of allowing them to remain 'synthetic'. AMG: Lets talk about the trilogy of albums you did for Hearts Of Space Records in the 1990's - Beguiled (1991), The Perfect Flaw (1994) and Shadowplay (2000). These are really refined, in terms of craft and arrangements, aren't they? You've got the sounds of piano, synths, violins, oboe and cellos perfectly blended. Can you talk a bit about this period? TS: Well with 1988's Glass Green album, I largely eliminated the piano and explored the most controlled, compact and organic electronic compositions that I was capable of. Ironically, it was released by Windham Hill, a label who had made its name in acoustic music. But I began to feel that there was something more. I felt that as my compositions got better, my ability to pull them off with only electronic instruments was getting strained. I imagined a kind of acoustic/electronic hybrid, where the soundstage was completely convincing and integrated - where the distinctions between acoustics and electronics were meaningless because they couldn't be unwound and separated, and because hopefully you wouldn't want to. But this meant a big and unsettling change in my working habits. I knew that unlike piano, where I could muddle through the playing myself, I would need really talented, sympathetic players. And since I wanted meticulously played classical instruments like cello and oboe, these instrumentalists would have to be orchestra professionals. This was a frightening and totally humbling thought. That I would need to expose my amateur methods and silly little compositions to real 'music professionals' - well, it took awhile to get up the nerve. But the 2 professionals I found, cellist Martha Reikow and reed player Kim Bryden, also turned out to be wonderful human beings. The subtlety, sensitivity and care that they brought to the music profoundly changed and improved it. AMG: Shadowplay seems to close a chapter in your career - post-2000, no other album you've released sits in quite the same musical territory as your HOS releases. Had you taken this personal style of chamber music as far as you could? TS: I don't think I took it quite as far as it could go, and it's a chapter I definitely want to revisit sometime soon, but I was getting restless again. Having opened up the instrumental performances to other players on my solo albums, I began to want to open up the compositional process to others as well. I'd worked on some more abstract music with Dwight Ashley; then just after Shadowplay, Hans-Joachim Roedelius and I decided to collaborate on a project together. It also combined acoustic and electronic elements but, in the spirit or our earlier efforts, wasn't afraid to explore the contrasts of spiky textures and unabashed synthesis. That sent me on a little journey of experimentation which included the solo electronica album Buzzle (2006), a film soundtrack and even a kind of mutant pop record Blue Tofu with singer/lyricist Andrea Mathews. 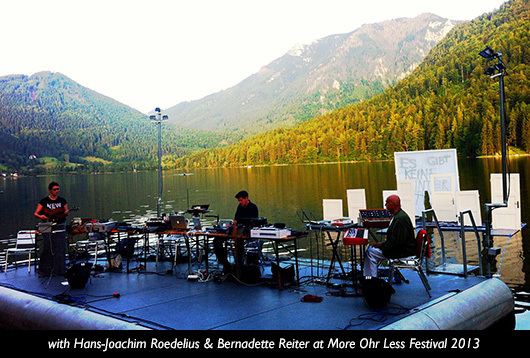 AMG: Seeing as Roedelius and yourself had already been friends for decades, what was it like finally making an album with him? Were you still in awe of your collaborator? TS: It's funny, I was always in awe of his records, but was never in awe of him as a person. Achim is way too personable and humble to ever let anyone be in awe for very long. He's such a natural, friendly, funny person - especially after having been close for so long, it was really just a couple friends in a studio making music. AMG: On the albums Lunz (2002) and Inlandish (2008) who did what, in terms of composition and performance? TS: We worked together here at my house on both, and the roles were always shifting. Sometimes we'd start with a keyboard idea of Achim's, sometimes mine. The basis of "Clue" for example was Achim's, while "Murmuring Mermaids" was mine. Or I'd set up a rhythmic delay and have Achim play various instruments through it, adding my parts later. On "Under Mars We Were", we sat next to each other at the synth, Achim playing the very sparse pattern and me 'playing' the filter which changed the harmonics of the notes in real time. It was really an organic process. The one constant with both albums was that I did the majority of the editing, post-production and mixing, since Ach's studio in Austria was a little more limited. AMG: Your album Snowghost Pieces with Cluster’s other half, Dieter Moebius, makes a stark contrast to your Roedelius collaborations/ It’s restless and spiky electronica, buzzing with quirky ideas and mischief. Does he bring out your dark side? TS: One of the things that made Cluster great was this tug between the musical language of the two of them. Like a lot of great art, it's the balance of light and dark, of beauty and strangeness, and that crucial interplay is what makes Cluster work so amazingly well. And Moebi's contribution to the duo is sometimes underrated I think. I share his love of rhythm, and his angular approach to sound, and I hadn't had a chance to explore that side of things much, so it was a pleasure to let that loose a little. Jon Leidecker, the third collaborator on Snowghost, also brought a great influence on the sound. Looking back, and this pertains to my work with Achim as well, I kinda feel that I alternated between the two aesthetics - when things were getting a little too sweet, I put my disruptive Moebius hat on, and when they felt a little too noisy or cerebral, I usually found myself drifting back to something more 'musical', or visceral - a melody, a harmonic structure to lend some shape or some emotional depth. AMG: And you produced Cluster’s final album Qua (2009) after more than a decade of silence from the band. I understand that it was you that got that album off the ground. How was their working relationship by that point? How did your involvement make the project work? TS: It was just a fantastic time. The vibe was so friendly, so relaxed among all of us - we'd all been good friends for quite a while. We'd work usually until late afternoon, then bust open the wine, toss something on the grill, hang out, and start all over the next day. I think I originally suggested the project to Ach and Moebi, and though they'd been invited several times to big high-end studios for a reunion, I think they decided to work here simply because it was low key and they felt comfortable. They both had spent time here with my family before, and I think they liked the idea of having a like-minded engineer/producer that would free them up to do the music like they did in the old days with Conny Plank. AMG: You've just released another piano-based album with Roedelius, called Lazy Arc (2014). Can you tell us a bit about that one and how it came about? TS: While Joachim and I were recording Inlandish in 2008 we developed the shorter, more structured pieces into the compositions for that album. But we had many hours of longer, more 'intuitive' improvisations that were really beautiful and compelling on their own, but didn't fit well into the concise structured nature of Inlandish. So Lazy Arc was woven together very carefully from these recordings as a kind of companion to Inlandish. It's designed as a single immersive 50-minute journey, sometimes tuneful, sometimes abstract, that winds its way more intuitively through seven interlocking movements. Achim has been a wonderful explorer of this kind of music and composition throughout his career. Lazy Arc was really a labor of love for us. It's a record that really rewards multiple listens, even if it uses a musical language that's a little different than Lunz or Inlandish. AMG: And the future – what are you working on, and do you see yourself still making music 10 years from now? 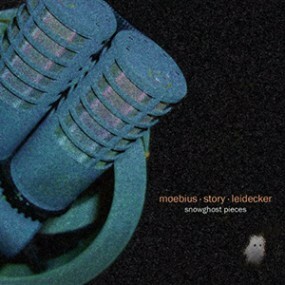 TS: Jon Leidecker, with a little help from me, is currently touching up the second album of pieces from our Snowghost sessions with Moebius. Then, long overdue, is a new solo album. I never thought it would be so long, but collaborations and other projects have led me down different paths lately, so it will be great to get back finally to a new album of my own compositions. And yes, I better still be making music in 10 years - not sure what it will sound like, but I hope there will still be a few people out there who will enjoy it. Lazy Arc, Tim Story's new album with Hans-Joachim Roedelius, is available now from his CD Baby page. This Is Tim Story mixed by Mike G - A 90 minute mix showcasing album highlights spanning 1981 to 2014, including both solo material and collaborations. Tim Story Live at Ambicon 2013 - Youtube video of his performance at the Hearts Of Space ambient-fest, also featuring Jeff Pearce on guitar in the 2nd half. 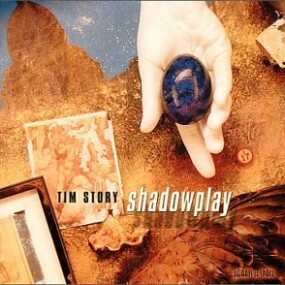 Ambient Music Guide's recommendations from Tim Story's discography.